Aim: Carpal tunnel syndrome (CTS) is the most common entrapment neuropathy and is one of the most common requests for electrodiagnosis. We aimed to note the relationship of subjective symptom severity of CTS, with objective electrophysiological severity and psychological status of patients. Patients and Methods: One hundred and forty-four consecutive patients of CTS referred to neurophysiology laboratory of a tertiary care hospital over 1 year were prospectively studied. 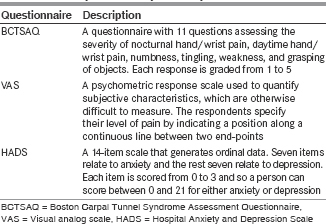 Boston CTS Assessment Questionnaire (BCTSAQ) and visual analog scale (VAS) were used to assess subjective symptom severity. Psychological status was assessed by Hospital Anxiety and Depression Scale (HADS). Electrophysiological severity of CTS was estimated by median motor distal latency and median to ulnar peak sensory latency difference across the wrist. Each parameter in both hands was scored from 0 to 3 depending on the severity grade, and a composite electrophysiological severity score (CEPSS) was calculated for each patient by summing up the scores in both hands. Statistical analysis was done by Spearman's rank correlation test. Results: There was significant correlation of BCTSAQ with VAS (P = 0.001), HADS anxiety score (P < 0.001), and HADS depression score (P = 0.01). CEPSS had no significant correlation with VAS (P = 0.103), HADS anxiety score (P = 0.211), or HADS depression score (P = 0.55). CEPSS had a borderline correlation with BCTSAQ (P = 0.048). Conclusions: While the subjective symptoms of CTS are well correlated with psychological factors, their correlation with objective electrophysiological severity is weak. Hence, prompt treatment of psychological comorbidity is important in symptomatic management of CTS; decision about surgical intervention should be based on electrophysiological severity rather than symptom severity. It is a well-known fact that psychological factors influence manifestations of a physical disease, a classic example being back and neck pain. Carpal tunnel syndrome (CTS) is a common entrapment neuropathy with a multitude of symptoms. It will be curious to know whether the symptoms of CTS correlate more with severity of entrapment or with underlying psychological state of the patient. This correlation is practically important as well since it can influence the treatment plan. CTS has a pleomorphic presentation, and hence, objective severity assessment by electrophysiology is very important. The current study was aimed to assess the relationship of subjective symptoms of CTS with objective electrophysiological severity and psychological status of patients. One hundred and fifty-one consecutive cases of CTS referred to neurophysiology laboratory of a tertiary care hospital from May 2014 to April 2015 were taken up for the study. They were included once the CTS was demonstrated by electrophysiology. Seven were not cooperative for the questionnaire assessment, and hence, they were excluded from the study. Demographic data and clinical features were collected from the remaining 144 patients with a structured pro forma. Severity of the symptoms was scored by Boston CTS Assessment Questionnaire (BCTSAQ) and visual analog scale (VAS). Psychological status of the patients was assessed by Hospital Anxiety and Depression Scale (HADS). A brief description about the BCTSAQ, HADS, and VAS is given in [Box 1]. Nerve conduction study (NCS) was done with Recorders Medicare Systems (India) machine with the following settings. Motor nerve conduction: high frequency (HF) - 5 kHz, low frequency (LF) - 2 Hz, sensitivity - 5 mV; sensory nerve conduction: HF - 3 kHz, LF - 20 Hz, sensitivity - 20 µV; F-wave: HF - 3 kHz, LF - 20 Hz, sensitivity - 5 mV. The room temperature was kept at 21–23°C in all the studies. The study was done in both upper limbs and the electrophysiology details noted included motor distal latency (DL), motor conduction velocity, motor compound muscle action potential (CMAP) amplitude, sensory peak latency, sensory nerve action potential (SNAP) amplitude, peak sensory latency difference along a homologous 8 cm segment of median and ulnar nerves across the wrist (P-W LD), and F-wave latency. 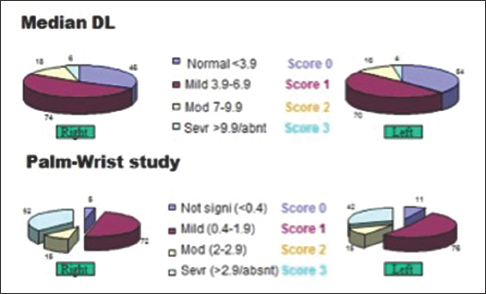 Severity of the median DL and P-W LD were scored from 0 to 3 [Figure 1]. A DL of <3.9 was considered normal (score 0); 3.9–6.9 was mild (score 1); 7–9.9 moderate (score 2); and ≥10/absent, CMAP response was considered severe (score 3). A P-W LD of <0.4 was considered not significant (score 0); 0.4–1.9 was mild (score 1); 2.0–2.9 was moderate (score 2); and ≥3.0/absent, SNAP was considered severe (score 3). A composite electrophysiological severity score (CEPSS) was calculated by adding both DL and P-W LD severity scores from the right and left sides [Figure 2]. Correlation between symptom score variables (BCTSAQ, VAS), psychological variables (HADS), and electrophysiological variables (CEPSS) was done with Spearman's rank correlation test. The magnitude of correlations between variables was compared and corresponding “P” values were used for defining significance. First, a ρ value was calculated and then corresponding “P” value was assigned using t distribution. A P ≤ 0.05 was considered statistically significant. SPSS 16.0 statistical software package was used for analysis. Out of 144 patients with CTS in our study, 29 were males and the mean age was 44.6 years (range 23–74 years). Symptoms were bilateral in 111, right sided in 20, and left sided in 13 patients. Forty-three patients had symptoms for <6 months, 31 had for 6–12 months, and 70 presented after 12 months of starting symptoms. Specific hand postures only evoked symptoms in 63 patients and the rest had spontaneous symptoms as well. Seven patients were hypertensive, 11 patients were diabetic, and two patients had rheumatoid arthritis. The median DL severity score (right and left put together) ranged from 0 to 5. P-W LD severity score was in the range 1–6 and the CEPSS was 5.38 (range 1–11). If median DL alone was taken, 26 patients were negative for CTS. The BCTSAQ score ranged from 11 to 47 (median 32) and VAS score ranged from 4 to 9 (median 7). HADS anxiety score was 0–21 (median 8) and HADS depression score was 0–15 (median 7). Spearman's rank correlation test showed significant correlation between the two symptom scores, BCTSAQ and VAS (P = 0.001). 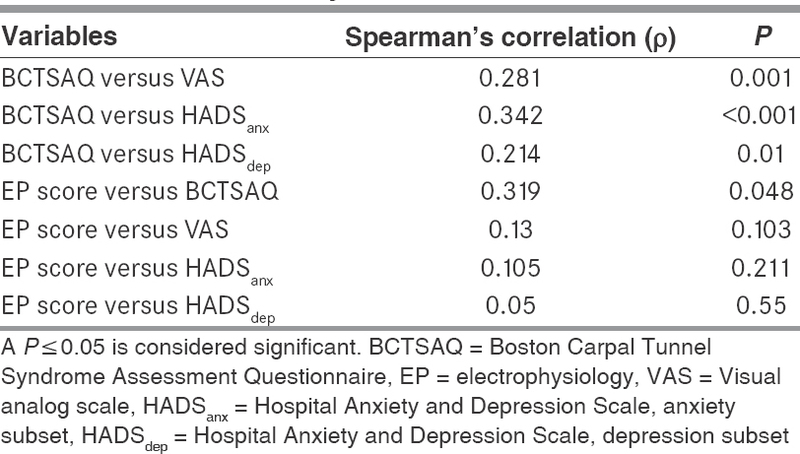 There was significant correlation of BCTSAQ with HADS anxiety (P < 0.001) and HADS depression (P = 0.01) scores [Table 1]. The CEPSS had no significant correlation with VAS (P = 0.103), HADS anxiety score (P = 0.211), or HADS depression score (P = 0.55). Correlation of CEPSS with BCTSAQ just reached statistical significance (P = 0.048). Like many other physical diseases with pain and discomfort, psychological status of the patient may be contributing to the physical symptoms of the disease. Although electrophysiology is very important in confirming the diagnosis, electrodiagnostic stratification may not be corroborating with pain sensitivity. Why some patients with milder entrapment have severe symptoms? Does psychological factors have any role in increasing pain sensitivity and hence severity of symptoms? In this scenario, the current study was designed to see the correlation of severity of symptoms of CTS with electrophysiological severity and psychological status of patients. The symptom severity was scored by a well-validated self-assessment test, BCTSAQ  and VAS. HADS  was used to assess psychological status. Scoring of the electrophysiological severity of the CTS was by a composite score (CEPSS) comprising the four-point severity scores of median motor DL and P-W LD from both hands. Similar to classical epidemiological studies, females outnumbered males (3.9:1) in our study; however, our patients were a decade younger, the mean age being 44.6 years. Since ours was a laboratory-based study collecting patients referred for an electrodiagnosis, all were symptomatic; 77% had bilateral symptoms. About half were symptomatic for more than a year; 56.3% had spontaneous symptoms, while the rest had symptoms with provocative posture only. Most patients had moderate to severe symptoms (median VAS score 7 and median BCTSAQ score 32). Psychological symptoms were present in most patients with generally significant involvement (median HADS anxiety score 8 and depression score 7). A CEPSS incorporating median DL and P-W LD detected all cases, whereas DL alone did not detect 26. The severity scoring of each variable was from 0 to 3, and hence, the maximum possible score was 12, taking both sides together. Although the score ranged from 1 to 11, the median score was 5.38, suggesting a mild to moderate involvement in most patients. Statistical analysis showed a good correlation between the two symptom grading tools, the BCTSAQ and VAS. The BCTSAQ score correlated well with both HADS anxiety and HADS depression, suggesting that CTS symptom severity has a direct relation to the psychological status of patients. The electrophysiological severity (CEPSS) was not correlated with symptom severity as assessed by VAS (P = 0.103) but correlated with another symptom grading tool, BCTSAQ. However, this correlation was of only borderline significance (P = 0.048). The CEPSS was not correlating with psychological status (HADS anxiety or depression). This means that the symptoms of CTS are correlated more with psychological status of the patient rather than the electrophysiological severity of the disease. The subjective-objective discordance in CTS severity observed here and in few other studies  goes in hand with observations stating that illness behavior is a better predictor of pain intensity in CTS and musculoskeletal pain syndromes than demographic factors and objective measures of disease activity., This is practically important as well since the release of entrapment alone may not alleviate the symptoms of CTS. Katz et al. had shown that despite surgical release of CTS, economic and psychosocial variables had a strong influence upon both return to work and the extent of symptom relief at 6 months. Hence, it may be argued that sometimes surgical release may not be required if the psychological factors are properly dealt with, at least in a percentage of cases having symptoms out of proportion to the objective entrapment by electrodiagnostic study. A recent study showed slightly contradictory results. Symptoms and signs are characteristic of CTS (using CTS-6 and Levine scale) significantly but incompletely coincided with electrophysiological testing in that study. However, the psychological factors did not correlate with objective electrophysiology, as noted in our study. Tricyclic and other antidepressant drugs are commonly used in the management of neuropathic pain including that of CTS., Besides the classical presynaptic monoaminergic effect, other pharmacological mechanisms such as interference with opioid system, interaction with N-methyl-D-aspartate receptors, and ion channel effects are hypothesized behind their analgesic role. The current study suggests that apart from the above-mentioned mechanisms, their effect in management of CTS may at least be partly due to the antidepressant action itself. NCS is the strongest predictor of outcome in CTS, and hence, in the light of the current study, we recommend that decision on surgical release of CTS should be based on objective electrophysiology rather than on symptom severity. The magnitude of symptoms should not be negated since we know that asymptomatic slowing across wrist in median nerve is not uncommon. Subjective symptoms of CTS are more correlated with psychological factors than with the objective electrophysiological severity of the disease. Prompt treatment of psychological comorbidity is important in the control of symptoms in CTS. The effect of antidepressant drugs may be related to their antidepressant property also, apart from the analgesic effect. Surgical decision in CTS should be based on electrophysiological severity rather than on symptom severity alone. Linton SJ. A review of psychological risk factors in back and neck pain. Spine (Phila Pa 1976) 2000;25:1148-56. Bland JD. Carpal tunnel syndrome. BMJ 2007;335:343-6. Nora DB, Becker J, Ehlers JA, Gomes I. Clinical features of 1039 patients with neurophysiological diagnosis of carpal tunnel syndrome. Clin Neurol Neurosurg 2004;107:64-9. Huskisson EC. Measurement of pain. Lancet 1974;2:1127-31. Zigmond AS, Snaith RP. The hospital anxiety and depression scale. Acta Psychiatr Scand 1983;67:361-70. Misra UK, Kalita J. An introduction to electrodiagnostic signals and their measurements. In: Clinical Neurophysiology – Nerve Conduction, Electromyography and Evoked Potentials. 3rd ed. Delhi: Elsevier; 2013. Cocito D, Tavella A, Ciaramitaro P, Costa P, Poglio F, Paolasso I, et al. A further critical evaluation of requests for electrodiagnostic examinations. Neurol Sci 2006;26:419-22. Practice parameter for carpal tunnel syndrome (summary statement). Report of the Quality Standards Subcommittee of the American Academy of Neurology. Neurology 1993;43:2406-9. Basiri K, Katirji B. Practical approach to electrodiagnosis of the carpal tunnel syndrome: A review. Adv Biomed Res 2015;4:50. Li Pi Shan R, Nicolle M, Chan M, Ashworth N, White C, Winston P, et al. Electrodiagnostic testing and treatment for carpal tunnel syndrome in Canada. Can J Neurol Sci 2016;43:178-82. Fernández-Muñoz JJ, Palacios-Ceña M, Cigarán-Méndez M, Ortega-Santiago R, de-la-Llave-Rincón AI, Salom-Moreno J, et al. Pain is associated to clinical, psychological, physical, and neuro-physiological variables in women with carpal tunnel syndrome. Clin J Pain 2016;32:122-9.
de la Llave-Rincón AI, Fernández-de-las-Peñas C, Laguarta-Val S, Alonso-Blanco C, Martínez-Perez A, Arendt-Nielsen L, et al. Increased pain sensitivity is not associated with electrodiagnostic findings in women with carpal tunnel syndrome. Clin J Pain 2011;27:747-54. Mondelli M, Giannini F, Giacchi M. Carpal tunnel syndrome incidence in a general population. Neurology 2002;58:289-94. Nunez F, Vranceanu AM, Ring D. Determinants of pain in patients with carpal tunnel syndrome. Clin Orthop Relat Res 2010;468:3328-32. Bair MJ, Wu J, Damush TM, Sutherland JM, Kroenke K. Association of depression and anxiety alone and in combination with chronic musculoskeletal pain in primary care patients. Psychosom Med 2008;70:890-7. Katz JN, Keller RB, Fossel AH, Punnett L, Bessette L, Simmons BP, et al. Predictors of return to work following carpal tunnel release. Am J Ind Med 1997;31:85-91. Makanji HS, Zhao M, Mudgal CS, Jupiter JB, Ring D. Correspondence between clinical presentation and electrophysiological testing for potential carpal tunnel syndrome. J Hand Surg Eur Vol 2013;38:489-95. Coluzzi F, Mattia C. Mechanism-based treatment in chronic neuropathic pain: The role of antidepressants. Curr Pharm Des 2005;11:2945-60. Bland JD. Do nerve conduction studies predict the outcome of carpal tunnel decompression? Muscle Nerve 2001;24:935-40. Werner RA, Jacobson JA, Jamadar DA. Influence of body mass index on median nerve function, carpal canal pressure, and cross-sectional area of the median nerve. Muscle Nerve 2004;30:481-5.